I don’t particularly like to post politically-themed articles on this blog, but I’m going to make an exception for this one, because it goes well with the idea that to build a strong apologetic, we have to have a solid foundation. As Christians, our foundation is the immortal, life-giving Word (revealed in Jesus and his written Word). If we start with the coherence of God’s Word throughout eternity, then our discussions will be filled with light and life in a dark world. In last night’s Republican Presidential Debate, the candidates bickered and squawked over trivial slights and only a few legitimate talking points. The Constitution was mentioned in abstract, but ALL candidates missed opportunities to turn everyone’s attention back to a proper foundation of understanding political discussion in light of the Constitution. That should be their foundation instead of personal likes/dislikes. This blog post says it very clearly. Missed opportunity #1 – When the discussion about illegal immigration was being discussed, Donald Trump said, “A woman gets pregnant. She’s nine months, she walks across the border, she has the baby in the United States, and we take care of the baby for 85 years. I don’t think so.” Either Ted Cruz or Rand Paul should have cut him off with a sharp rebuke. IT’s NOT THE GOVERNMENT’S JOB TO CARE FOR ANYONE!!!!! Where do our rights come from? Are our rights (religion, speech, press, assembly, petition, bear arms…) granted to us by the government? If it is the government that grants our rights, then the government can take them away as well. When we read the Constitution, it is clear that the Constitution is there to RESTRICT the government from withholding/obstructing the rights of citizens of the United States. So, if they do not come from the government, from where do they come? This week, CNN anchor, Chris Cuomo said that rights come from man. Again, if rights come from man, then they can be taken away by man. Well, this flies in the face of the primary historical document of the United States, the Declaration of Independence. The Creator has endowed rights to mankind. The Constitution is written to protect these inalienable rights and to limit the power of the government to within very specific boundaries. Vox Day takes the premise of Mr. Cuomo to its logical conclusion when he shows quite clearly that mankind tends to treat poorly those who are different or with whom they disagree. This is why the Left is so willing to abrogate and alienate what the Declaration of Independence declared to be self-evident and unalienable rights, among them being Life, Liberty and the pursuit of Happiness. They simply don’t accept that God-given rights are not laws, or that laws that do not respect those rights are illegitimate. Worst of all, the Left fails to grasp the obvious consequences of their ill-considered actions. If the law can legitimately permit a homosexual man to force a Christian man to bake him a cake, then it can legitimately permit a white man to force a black man to pick his cotton. If the law can legitimately deem a man to be a woman, or two men to be married, it can just as legitimately deem a Jew to be subhuman or an African to be a monkey. Thankfully, there is a God, and all of mankind has been created in his image. We all have value and unalienable rights from the Creator. Don’t let the Left control the argument lest they follow their presuppositions to their wicked conclusions. UPDATE: My daughter is traveling with her class to Washington DC. 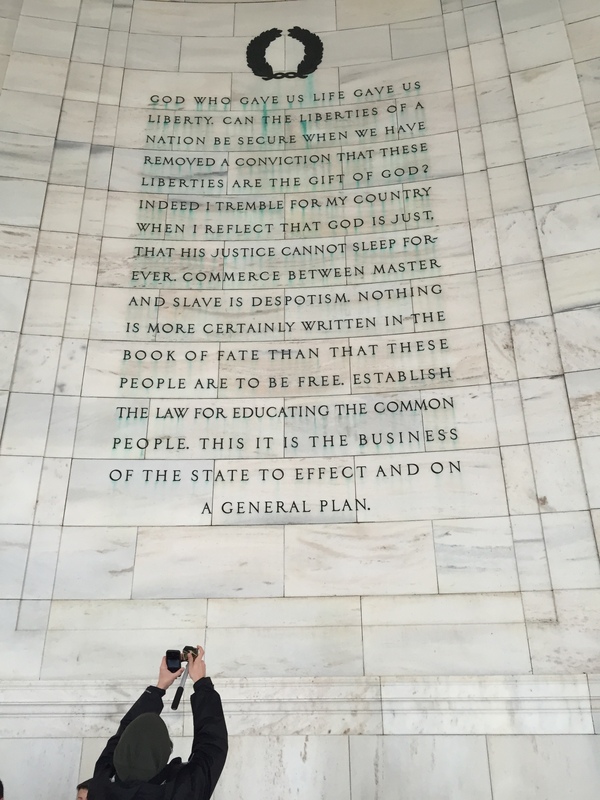 She sent me this picture from the Jefferson Memorial. If you read closely, you’ll see that it was the founding fathers of this country who understood the importance of recognizing the source of our freedoms. Can Christians Disregard the Bible? Do I believe that God literally drowned every living creature 5,000 years ago in a global flood except the ones who were living in a big boat? No, I don’t. Because of science and rational thought. It sounds like he would rather trust the naturalistic presuppositions of atheists as the ultimate authority over the truth revealed in God’s word. 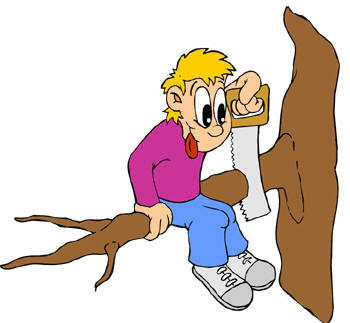 What is the difference between a rational person and an irrational one? A rational person has a good reason for his or her beliefs. An irrational person does not. But what we have seen above is that only the Christian worldview can allow us to have good reasons for our most basic beliefs – our presuppositions. Apart from the Christian worldview, any reason that we offer for any belief cannot be ultimately justified. It would appear that there are only two options for a person to hold. One can either be a consistent Christian, or one can be irrational. If Gungor wants to call themselves a Christian band, it makes sense that they would embrace the Bible as God’s revealed word, but if they are going to instead elevate the atheistic presuppositions above scripture, then they should cease calling themselves a Christian band. A new friend relayed a story to me, and I’m very troubled by his response. See, my new friend is a youth minister with the daunting task of living as somewhat of an authority figure on the Bible and the things therein. One of the kids from my youth group went off to college to major in some science. He called me one day saying that his geology professor convinced him that the Bible was wrong. His geology professor told him that there was no evidence for a worldwide flood, so that Bible could not be correct. The young college kid was really distressed. So, I told him not to worry. The writer of this passage was probably a shepherd in a pre-literate civilization and he just got that story wrong. I listened to his story with utter disbelief. What is this young college student now to think about the authority of scripture? When someone next challenges the youth about the prophecies of Daniel, what can he learn from this exchange? Well, Daniel was a slave in a pagan culture, so he surely would have embraced mysticism. His mystical writings about dreams can be ignored. What about the resurrection of Jesus? Since the accounts of the death and resurrection of Jesus was written by a crooked sellout accountant, a quitter evangelist, a historian, and a man who saw visions of dragons, can they be trusted? Should we expect them to understand the scientific impossibilities associated with someone coming back to life after being beaten, scourged, crucified, and impaled? That is…if they can be believed in their account at all. It’s a slippery slope to doubt the source of the Bible. Is the Bible the inspired and inerrant Word of God or it is a collection of pre-literate shepherd’s ramblings? The answer has profound implications for your faith. Our understanding of the veracity of scripture will be a foundation upon which to build our faith. Will that foundation be built with mythological sand or trustworthy granite? Since God is pre-supposed as the ultimate authority, then the absolute truth of his written revelation to us in the form of the Bible is a necessary precondition for intelligibility.